IRVINE, Calif., March 14, 2017 — Today Kia Motors America (KMA) began a new program with Amazon to provide plug-in vehicle customers with easy, one-stop shopping for a home charger and installation services using the same easy digital Amazon shopping experience they have come to love. 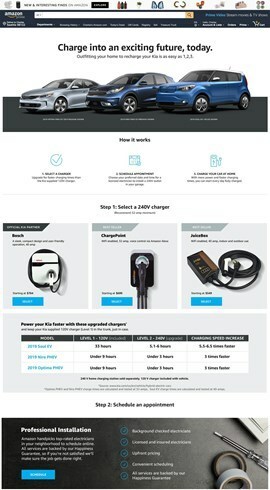 Before they even bring home their new Soul EV, Niro EV1, Niro PHEV or Optima PHEV, customers can visit www.amazon.com/ChargeMyKia to learn everything anyone needs to know about choosing a charger, having it installed, and charging at home. At the website, they will find recommended Level 2 or 240-volt charging units selected by Kia, information about EV home charging installation and helpful reviews from other Amazon customers. And they can see upfront pricing for electrical services and schedule a licensed electrician to install an EV charger and a 240-volt outlet if needed. Amazon’s Happiness Guarantee backs all home charging installation services, so customers know it will be done to their satisfaction and they can rest assured that their vehicle is supported by Kia’s excellent warranty2. 1 In select retailers in select markets with limited availability. 2020 Niro EV expected spring 2019. 2 The Kia 10-year/100,000-mile warranty program includes various warranties and roadside assistance. Warranties include powertrain and the New Vehicle Limited Warranty (Basic). All warranties and roadside assistance are limited. See retailer for details or go to kia.com.